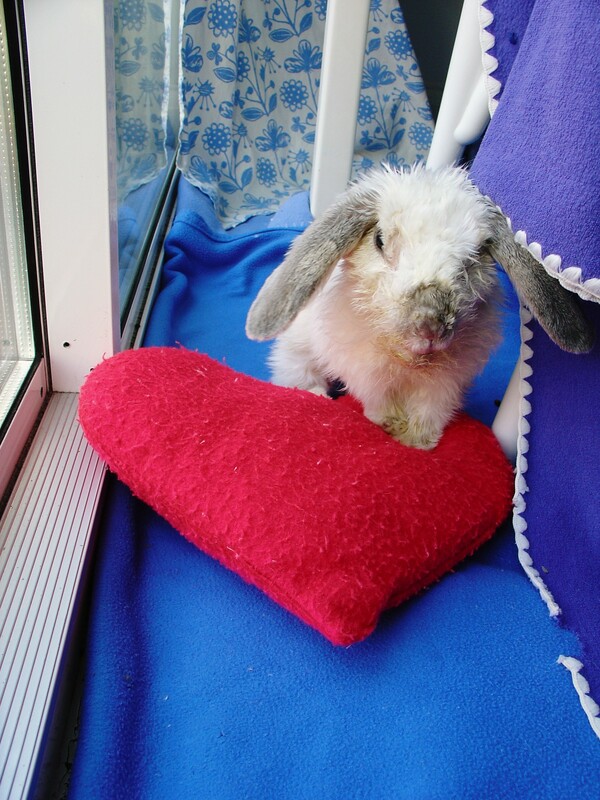 Rabbits respond to the care and love they receive by becoming very loyal and affectionate. Of course like other companion animals they are especially fond of the person providing food, but their friendship extends to other people as well, including sometimes strangers. Being timid and sensitive creatures, their displays of affection may be less obvious than those of a cat or dog. In addition most rabbits don’t like to be held and don’t jump in your lap, like a dog would. This is perfectly normal and not a sign that your rabbit is unfriendly. Befriending a rabbit requires that you first gain her trust. You do this by meeting her needs and treating her gently and patiently at all times. Timid bunnies and those who have been abused or neglected will require longer to bond with you, but their affection is even more rewarding. They usually start by not running away and by eating, grooming and sleeping in your presence. Nudging Gentle nudging of your arm and leg (often two or three times in a row) is a welcoming gesture and a sign of affection. It is also a request to be petted. Licking/nibbling/grooming A rabbit who licks and nibbles his human is showing deep affection. Rabbits may lick your hand while they are being stroked, or they may ‘wash’ your hands and face when it’s your turn to be petted. My rabbit will even interrupt her meals, playtimes and grooming sessions to come and lick me. Huddling together Instead of licking, many rabbits prefer to snuggle up to their human and animal friends. They may sit nose-to-nose with another rabbit or curl up next to you on the sofa. Some rabbits even fall asleep on their humans’ slippers and other items of clothing. These friendly gestures are often overlooked by people, but it’s a great compliment when a rabbit wants to be near you without the enticement of petting or food. Following like a dog Affectionate rabbits tend to follow you around the house, often running between your feet or honking softly to get attention. Companionship Rabbits are good at keeping company, whether it’s waiting for you outside the bathtub or sleeping under your desk when you work late. Our friends’ rabbit Kellogg doesn’t like to be touched or petted, but he enjoys being in the same room as his caregivers. Greeting Some rabbits will wait for you by the door when you return home. Others will greet you first thing in the morning by circling the bed or jumping on it. However not all rabbits do this, for instance my house rabbit only greets me at the front door if I’ve been to the greengrocer’s or the garden centre! Coming when called This can also be a sign of devotion on the part of your rabbit. Don’t expect too much though, as even trained rabbits may deliberately ignore you if they’d rather do something else. Sensitivity Many people would say their rabbit can sense when they are ill or there’s something wrong. One of our members, who spends a lot of time confined in bed due to back problems, tells me her rabbit Booboo seems to know when she in pain and becomes very gentle and quiet. Increasingly rabbits are being used to assist patients’ recovery in hospitals and elderly people’s homes in the UK and the U.S.